This page gives an overview of the Editorial UI and also contains some useful tips and tricks to help you get the most out of it. The app is organized in three main panels that you can show and hide by swiping left and right. In the file browser you can view a list of your files and folders, and create new documents. You can work with local files that are only stored on your device, or sync with Dropbox. When you first select the Dropbox folder, you’ll be asked to link your Dropbox account with Editorial. By default, Editorial syncs with the folder /Apps/Editorial in your Dropbox. If you want to use a different folder, you can change this in the settings. The bottom toolbar lets you to add a new document (+ button), change the sort order of the list (by date or by name), open the settings, or start a Dropbox sync. Note that Editorial syncs with Dropbox automatically, so you only have to trigger a manual sync if you made changes on other devices less than a few minutes ago. To delete or move files, tap the Edit button at the top. This allows you to select multiple files and then choose the action you want to perform at the bottom. You can also use a swipe gesture to delete single files. When you tap the + button, the template picker is shown, and you can select the type of document you’d like to create. The document templates are all empty by default, but you can easily create your own templates by tapping “New Template” at the bottom of the picker. Templates can be useful for creating documents that have a fixed format, e.g. 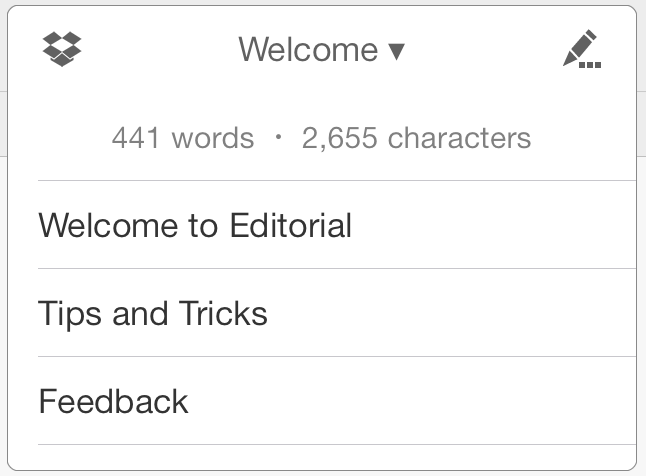 report cards, but Editorial’s template system is actually much more powerful than that. Each template is a complete workflow that can include custom logic or even UI that is shown before or after the document is created. For example, if you prefer to enter a filename before a document is created, you can easily do this by adding a Request Text Input action before the Create Document action (which is included by default in a template workflow). To learn more about workflows, please refer to the Building Workflows chapter – everything you can do in a workflow also applies to document templates. When you have a document open in the editor, you can tap on its title to open the navigation/outline popup. The type of outline depends on the document – a list of headers will be shown for Markdown documents, a list of projects for TaskPaper files. Tap a heading to navigate quickly within larger documents. You can also rename a document from the navigation popup. If your document contains links, you can open them in the in-app browser by tapping. This only works while the keybord isn’t active because it would otherwise be difficult to select text without accidentally opening links. To open a link while editing, simply select the link’s title and choose “Open Link” from the editing menu. The Aa button allows you to adjust editor-related settings quickly. On the iPhone, you’ll find the button at the top of the document outline (tap the title first). Syntax Mode – If you use uncommon file extensions for Markdown (or any other supported document type), you can switch to a different mode here. The selected mode will be remembered for all files that have the same file extension. By swiping left and right on the extended keyboard row, you can move the caret on the current line, which can make it easier to position it precisely. Many keys can be used for multiple characters. Tap and hold one of them to show a popup, slide to the character you want, and release the finger. On the iPad, you can also perform a swipe-up gesture on such a key to insert the first alternative character, without having to wait for the popup. When you have text selected, you can use the (, ), [, ], ", ` and * keys to enclose the selection in a pair of matching characters. On the * key, you can also do a swipe-up gesture to enclose the selection in two asterisks on each side (making the selected text bold in Markdown documents). Entering an opening bracket or parentheses automatically inserts the matching counterpart (this can be disabled in the editor settings). iPad only: You can swipe up on the Undo key to redo changes (alternatively, you can tap and hold it to select from Undo and Redo ). iPad only: To quickly insert a footnote, simply tap the [ key, then swipe up on the same key to insert the ^ character (the closing ] is inserted automatically). Tap on text in the editor with two fingers to quickly select an entire paragraph. Snippets are little pieces of text that you can insert quickly by typing abbreviations, or by selecting them from the snippet list that is available on the extended keyboard. A snippet is basically the same as a workflow with a single Replace Selected Text action, but it is much faster to create. Snippets can contain any of the built-in variables, so you can use placeholders for the current date, selected text, clipboard contents, or even the title of the page currently loaded in the browser panel. You can also define where the caret should be after inserting the snippet. You can reveal a collection of different accessory panels with a left swipe gesture in the editor. 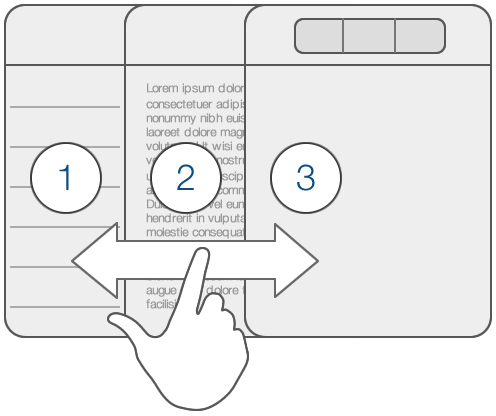 These panels contain helpful additional tools that are not directly related to editing text. When you’re editing a Markdown or Fountain document, this panel shows an HTML preview of your current document. It is refreshed automatically when you show it. Using the Show HTML action in a workflow, you can also use this panel for showing dynamically-generated, custom HTML. Editorial includes an in-app web browser for quick research while you’re writing. To open a browser tab, simply tap the “Add tab” button in the accessory panel. You can automate some aspects of the web browser using workflows, e.g. with the action-open-url workflow action. The current URL or page title of the browser can also be used within snippets, e.g. if you want to create a snippet that inserts a Markdown link to the currently loaded page. The console shows output from Python scripts (see Scripting Editorial with Python), and can be used to enter Python commands interactively. You can open the console from an empty web browser tab. Even if you’re not interested in the programming part, you might find it useful as a calculator – just try entering some mathematical expressions like 12 * 4 + 5. It is also used by the Console Output workflow action.